rabble blogs are the personal pages of some of Canada's most insightful progressive activists and commentators. All opinions belong to the writer; however, writers are expected to adhere to our guidelines. We welcome new bloggers -- contact us for details. Alberta Premier Alison Redford said NDP leader Thomas Mulcair was "divisive and ill-informed." Saskatchewan Premier Brad Wall said Mulcair was "risking Canadian economic advantage for the sake of politics." Conservative Finance Minister Jim Flaherty said, " I think his (Mulcair's) logic is off and doesn't make sense." Former federal Liberal leader Stephane Dion said, "Mr. Mulcair's comments are factually wrong and politically ill-advised. We don't need another divisive leader -- we already have Stephen Harper." Media pundits jumped into the fray accusing Mulcair of playing a diabolical game, launching a political jeremiad to write-off the West and establish a beachhead in Ontario with which he could put together a winning formula for the next election. What was his sin? Mulcair suggested that Canada suffers from Dutch disease. What is this disease whereof they speak? In 1959 natural gas (estimated reserves of over 100 trillion cubic feet) was discovered in the Groningen gas fields in northern Holland. Their exploitation created a huge economic boom, which paradoxically crippled other elements of the economy. Why? Revenues from the sales of natural gas appreciated the value of the guilder (the Dutch currency), in large measure because the Dutch government spent the money profligately. Between 1959 and 1981 government spending in the Netherlands increased from 10 billion guilders to over 130 billion guilders. Over the same period the value of the guilder increased by 35 per cent in real terms. The increased value of the currency made exports of goods, particularly manufactured ones, much more expensive leading to a significant decline of the manufacturing sector in Holland. For example, between 1964 and 1986 the number of industrial workers in the Netherlands fell from 1.823 million to 1.381 million, a 25 per cent reduction in the labour force. The impact of this "disease" was to cause a long period of stagnant growth and unemployment, and major, and to some extent permanent, shifts in economic sectoral structure of the country. This phenomenon, of revenues from a booming resources sector damaging the manufacturing sector, became known as Dutch disease following a 1982 investigation by economists W. Max Corden and J. Peter Neary. 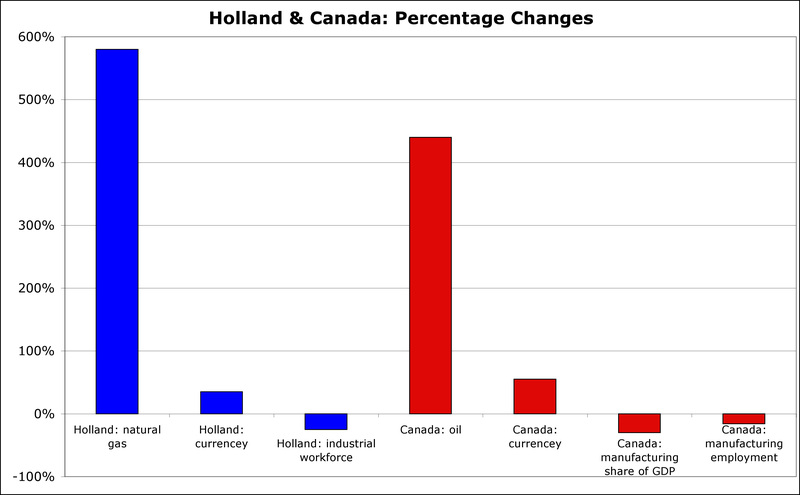 Does Canada suffer from Dutch Disease? The short answer is yes. A quick historical review: in 1998 the average price for West Texas Intermediate crude oil was $16.74; it is currently trading at $90.72, having more than quintupled in price. While the extraction of oil from bitumen (a.k.a. "tar") is costly, difficult, and requires increasingly more energy input per barrel of oil output, the meteoric rise of oil prices has made it economically worth pursuing. Coincident with this has been the meteoric rise of the Canadian dollar that in 1998 traded at $0.63 against the US dollar. It rose to a high of $1.10 in 2007 and is now trading at $0.98, 55 per cent higher than it was in 1998. This synchronicity of is not coincidental; the rising price of oil has converted the Canadian dollar into a petrocurrency whose value is increasingly linked to the price of oil. And what's happened with manufacturing over this time? Between 1980 and 2000 the manufacturing share of Canadian GDP remained more or less stable at approximately 17 per cent. Since then it has declined at a very steep rate to approximately 12 percent today, a 30 per cent decline in value (Statistics Canada). Furthermore, between 1998 and 2006 the share of Canadian manufacturing employment fell by 16 per cent (Beine, Bos & Coulombe). As an illustration of how an inflated petrocurrency affects manufacturing, consider this: Canada's foremost manufactured export is motor vehicles. Between 2001 and 2007 the unit value of Canada's exported vehicles rose from US$16,404 to US$18,748. But with the Canadian currency dancing to the tune of inflating oil prices the price realized in Canada in Canadian dollars fell from $26,039 to $18,201, a 30 per cent decline in revenues (Bimenyimana & Vallée). Ouch! As Andrew Nikiforuk in Tar Sands: Dirty Oil and the future of a Continent, writes, "Oil can reduce every other economic sector, no matter how tall, to a midget." There are, however, many factors at play in an economy and this apparent coincidence cannot simply be taken at face value. Consequently, economists Michel Beine, Charles Bos, and Serge Coulombe investigated the impact of the increase of oil prices, the consequent spectacular development of the Athabaska bitumen sands, and their impact on the Canadian economy with a series of sophisticated statistical analyses in order to carefully separate Dutch disease from other factors in the economy. Their results showed that "54 per cent of the manufacturing employment loss due to exchange rate development between 2002 and 2007 are related to a Dutch disease phenomenon. The remaining 46 per cent can be ascribed to the weakness of the US currency." Economists Célestin Bimenyimana and Luc Vallée concur with an even more recent 2011 study and point out a particularly troubling feature of the Canadian strain of Dutch disease. While the Netherlands are a geographically small and socio-culturally homogenous country, the same is not true for Canada. In the Netherlands workers who lost jobs in manufacturing could readily retrain and find positions in the gas industry. In Canada, 95 per cent of the nation's oil reserves are in Alberta while 75 per cent of manufacturing is based in Ontario and Quebec. Geography, culture, language, and inter-provincial regulatory barriers (i.e., recognition of professional credentials in the building trades) limits labour mobility (or socially hollows out communities in central and Atlantic Canada). In either case when the resource boom ends (as it inevitably must) the consequences are the same; the manufacturing sector is crippled, perhaps irrevocably, as manufacturing shifts to other portions of the globe (India, China, Brazil, Asia-Pacific, etc.) where low labour costs and lax regulations are ready to poach business from developed nations. Dutch disease is a real economic phenomenon that has been witnessed and investigated in the economies of many nations that have seen resource booms (Australia, Indonesia, Nigeria, Philippines, Russia, Norway, United Kingdom, etc.). It is, furthermore, alive and well and living in Canada. A recent study by the Pembina Institute, In the Shadow of the Boom: How Oilsands development is reshaping Canada's economy by Nathan Lemphers and Dan Woynillowicz has identified a specific strain of Dutch disease (a.k.a. "oil sands fever") that is creating asymmetries the Canadian economy described above. How then to explain the fierce attacks on Thomas Mulcair by premiers Redford, and Wall, Finance Minister Flaherty, and Stephane Dion, and the jeremiads of assorted pundits such as David Frum who celebrated Mulcair's "deserved media beating over his 'Dutch disease' remarks" in the National Post? Joining the ranks of Holocaust denial, climate change denial, evolution denial, the denial of tobacco use leading to lung cancer, and extending back to the campaign against Galileo's assertion that the earth orbits the sun, we have a new phenomenon -- Dutch disease denial. Like other such historical movements it consists of looking reality in the face, and then pretending it doesn't exist. In the case of Dutch disease denial, it is clear what drives the phenomenon -- petro-greed, climate change denial, and a conviction that wholesale, unregulated, untrammeled resource exploitation should be the defining feature of economic development. The global petroleum industry is the largest and most powerful economic force on the planet. Having firmly attached themselves to the earth's oily teat, they are loath to let go; climate change, peak oil, Dutch disease, or anything else notwithstanding. Sucking the earth dry and locked into arrested infantility they are unable to grow up and responsibly contemplate a sustainable future. This situation might sound like a zero sum game (manufacturing's loss is petroleum's gain and vice versa) but in fact (setting aside, for a moment the issue of climate change) there are uncomplicated and effective solutions to this problem which economists such as Beine, Bos, Coulombe, Bimenyimana, and Vallée and analysts like Nikiforuk have all taken pains to point out. 1. First: slow down. The frenzied (and accelerating) pace of development of the tar sands undermines all efforts at rational development and use of the resource, not only in regard to Dutch disease, but in regard to every one of the myriad problems that plague this resource. Climate change, rational taxation, a national energy strategy, infrastructure and work force issues, pollution, impacts on aboriginal people's, social issues, planning issues, energy security ... everything is being swept into an insane vortex of activity, in which the long-term potential of Alberta bitumen within a framework of energy security, a transition to a sustainable economy, and the development of renewable energy is being utterly lost. The principal beneficiaries of this process are the executives and shareholders of the petroleum multinationals and greedy foreign markets whose only interest is exploiting this resource as rapidly as possible. 2. Establish a national sovereign fund for bitumen sands royalties. Separate the use of this fund from general provincial and federal spending, and in particular, make investments from this fund in foreign economies. This both saves a lot of money for the proverbial rainy day, and it can limit currency inflation. This was the one successful approach adopted by the government of Norway when it established the Petroleum Fund of Norway (now called the Government Pension Fund of Norway) in 1967. With a current value of US$613 billion (one percent of global equity markets) it is now the largest fund of its kind in the world, and the largest stock owner in Europe. In Canada, the Alberta provincial government established the Heritage Savings Trust Fund in 1976 and for a decade 30 per cent of province's oil and gas revenues went to the fund, but contributions ceased in 1987. Since then the province has been a) spending oil revenues like a drunken sailor on infrastructure and other programs; b) has been drawing interest out of the fund and plowing it into general revenues; and c) has no policy directed at investing resource revenues in foreign assets -- in other words everything it can do to inflate the value of the currency. And, of course, there is no Canadian national fund of this kind. 3. Andrew Nikiforuk in Tar Sands points to Alberta's abysmally low royalties for bitumen extraction, a situation which has benefited oil companies, forfeiting monies which ought to accrue to Albertans and Canadians, and has lead to inefficient use of capital, sped development, accelerated inflation, and bedeviled project management. The province charges oil companies a one percent royalty on tar sands revenues until they recoup all their investments (thereafter a 25 per cent royalty rate kicks in). The Alberta government charges the lowest rates of almost any government in the world; its share of all oil revenues is only 39 per cent. Compare this to the 76 per cent that Norway collects. Nikiforuk urges the Alberta government to collect higher, more rational royalties and to introduce a provincial sales tax. 4. Economists such as Bimenyimana and Vallée urge the federal government to undertake economic measures, such as aggressive research and development (R&D) subsidies and tax credits, to maintain and strengthen the manufacturing sector pointing out that this would not only lessen the "East-West economic growth divide and wealth disparities, it would also ensure that, years down the road, when the oil boom is over, Canada remains competitive in sectors that cater to the manufacturing industry." 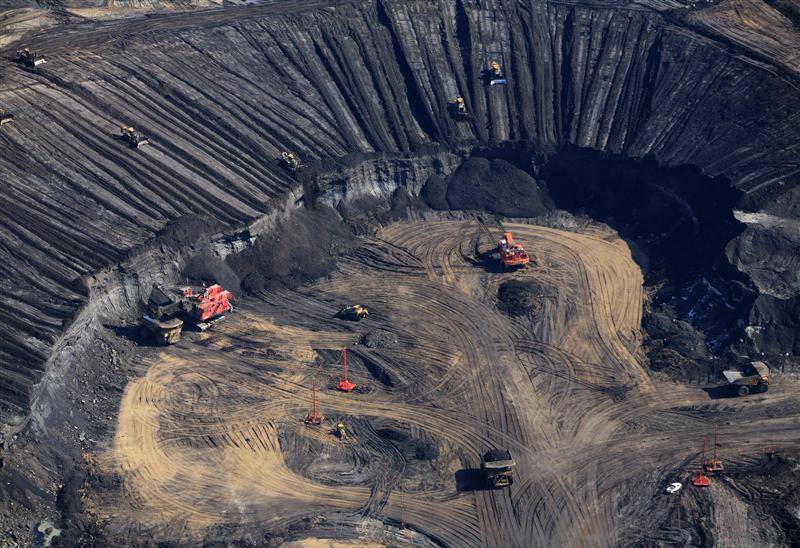 It is time for Canadian governments (federal and provincial) to get their collective heads out of the tar sands, stop trying to shoot the messenger if they don't like the message, get out of denial, and read the economic writing on the wall. Dutch disease is writ large for anyone with the wit to open their eyes. It is a problem; there are solutions. It's time government policy put the interests of Canadians first rather than catering to the desires of the multinational oil conglomerates. Oil can not only diminish other economic sectors to a midget, but the minds of politicians into intellectual dwarves. Christopher Majka is an ecologist, environmentalist, policy analyst, and writer. He is a the director of Natural History Resources and Democracy: Vox Populi.